C major is a major scale based on C, which is made up of the pitches C,D,E,F,G,A,B. Its key signature has no flats or sharps (see below: Scales and keys). 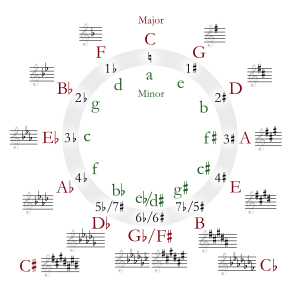 Its relative minor is A minor, and its parallel minor is C minor. A scale in both C major and A minor can be played on a piano or other keyboard instrument using only the white keys. ↑ Matthew Nicholl & Richard Grudzinski, Music Notation: Preparing Scores and Parts, ed. Jonathan Feist. Boston: Berklee Press (2007): 56. ISBN 978-0-87639-074-0. "In popular and commercial music, the old key signature is cancelled only if the new key is C major or A minor."